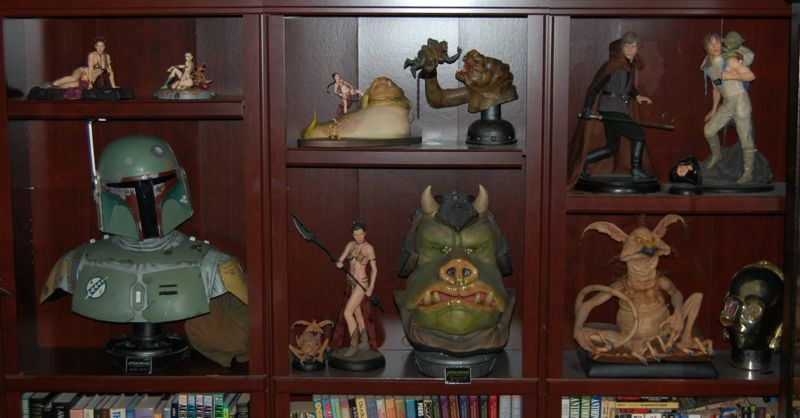 As I said in my post about the Life Size Gamorrean Guard bust from Sideshow, I used to have a few of Sideshow’s other Life Size Star Wars busts, but decided to get rid of them since they take up a lot of space and are expensive. But that was back when the life size bust line consisted entirely of alien characters. Now that they are expanding into major characters like Darth Vader, it’s more attractive to me. And I really love my Gamorrean Guard bust, so I thought it would be cool to get some other characters associated with Jabba’s palace. Technically, this is the Empire Strikes Back version of the costume, but I think it can fit in a Jabba display just fine, and in any case there is no ROTJ version available. 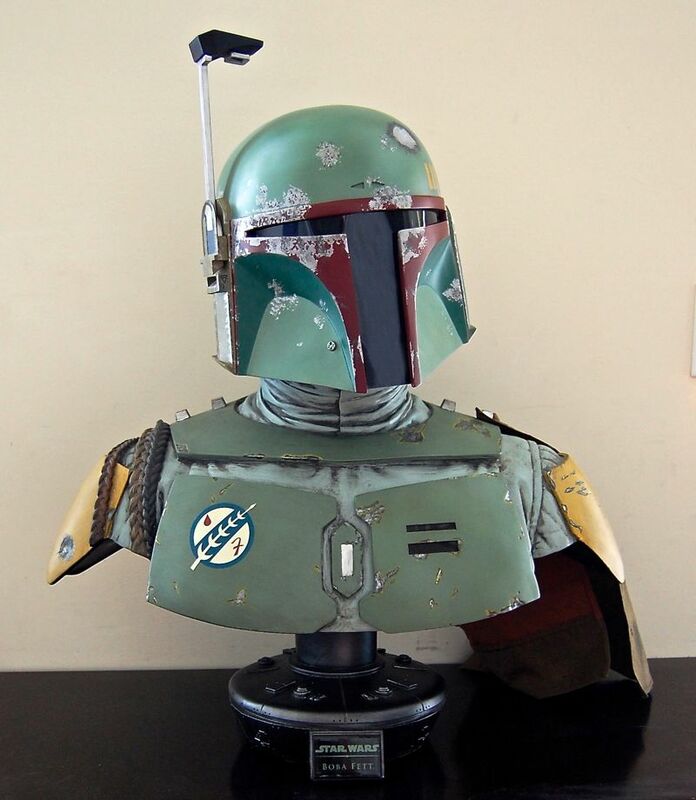 The Boba Fett bust retails for $800, but it’s still available on Sideshow’s site for retail price — probably because the edition size is set at 1,000 pieces. 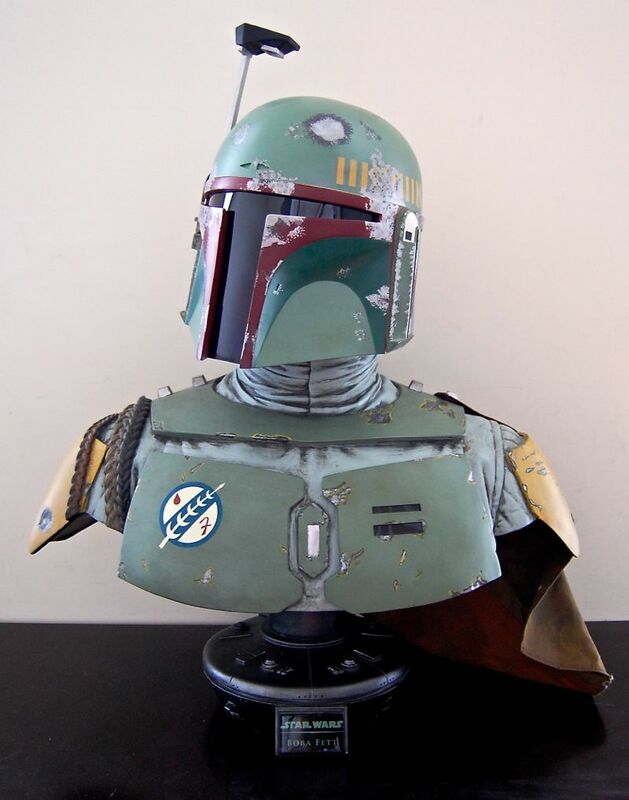 Even for a popular character like Boba Fett, that’s a lot. This obviously makes it a little difficult for people trying to sell — you have to give a good discount or people will just buy it new from Sideshow. There was quite a bit of griping from Boba Fett fans when this was originally announced. Some of it was certainly merited. 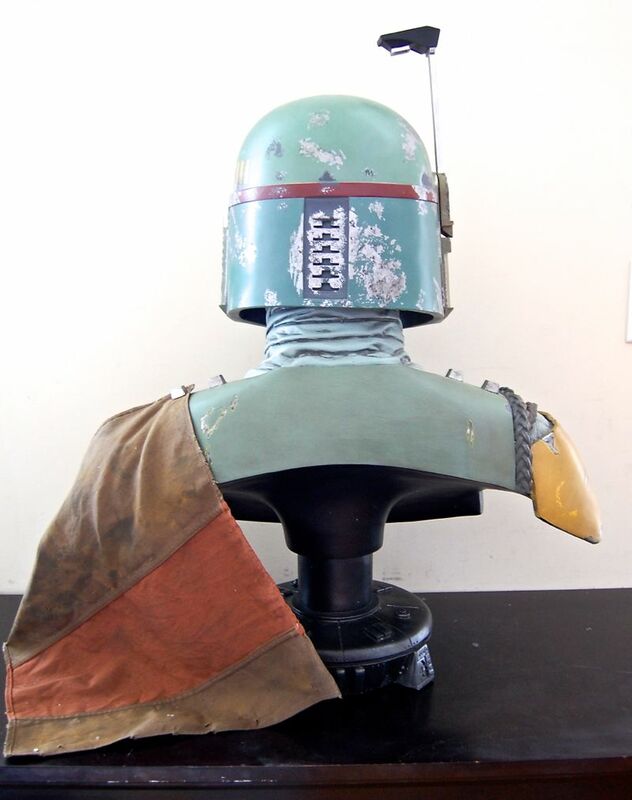 Boba Fett’s costume is one of the most complex in Star Wars, so there’s a lot that can go wrong, from the color to the placement of the weathering and shape of the armor. The biggest complaint seemed to be that the original prototype had a “pinched” visor that got smaller as it went from the eye area to the bottom of the helmet, which isn’t accurate. Sideshow makes some great products, but generally speaking they don’t seem overly concerned with accuracy. They want to make a statue that looks good overall, but don’t seem to mind if there are some inaccuracies. That’s why I was pleasantly surprised to find out that they actually corrected the helmet in the final product. If anything, their products tend to get worse in production, since the factory paint job is usually not as nice as the one on the prototype. But in this case, even the paint seems pretty much as good as the prototype. 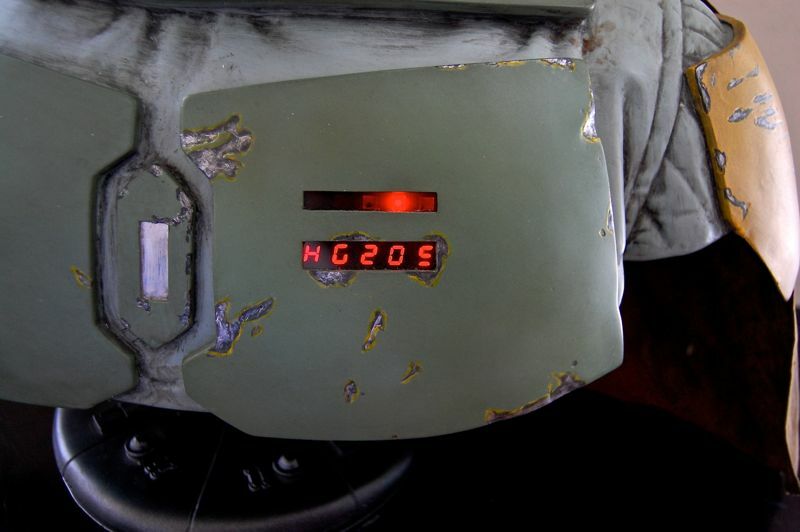 The weathering is nicely done. While you can tell that it’s not really chipped and worn paint if you look at it closely, when viewed from a reasonable distance the effect is very impressive. The wookie braids on his shoulder are sculpted rather than being made of some kind of actual hair-like material, but I think that was the best choice. It might be difficult to get the exact look they wanted with real hair. 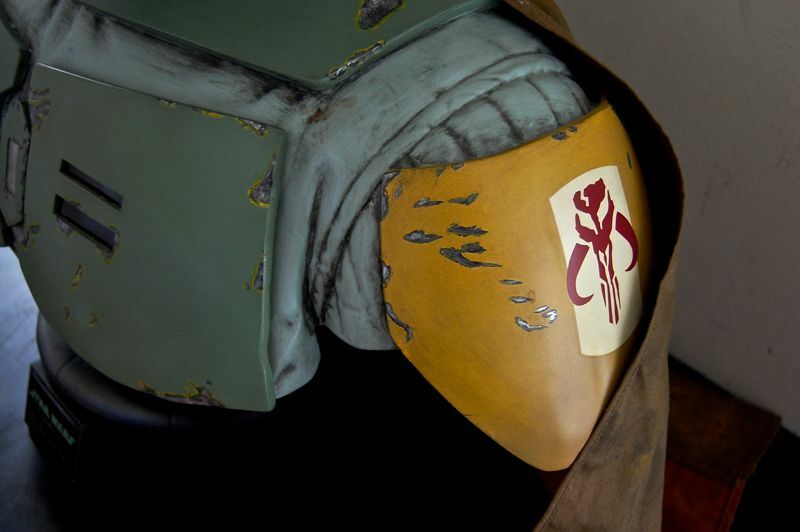 The symbols like the “wheat” symbol on his chest (which always looked like a baseball to me) and the Mandolorian skull symbol are nicely painted. I imagine they’re transfers of some kind, but they look nice and crisp. He comes with a bit of cloth that is meant to be part of his cape. One of the rivets on his shoulders comes out, and that’s where it attaches. I think it looks nice, and in this case using cloth was probably the only option. There’s a digital readout in his left chest plate. The whole plate attaches with magnets and actually lifts out, allowing you to install some AA batteries for the lights. I’m not sure if the actual symbols are accurate to the film. They just sort of cycle through a bunch of apparently meaningless symbols, although some are English letters and numbers. There’s a button underneath that lets you turn the lights off and on, but like most light features, I can’t see using this very much. One nice feature is that you can turn his head from side to side. This gives you some more freedom in how you display him. I think having him look a bit off to one side probably looks the best. 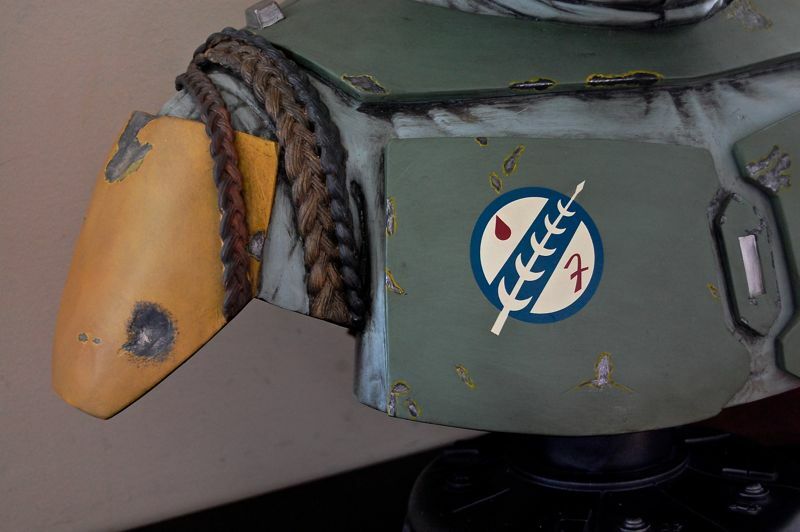 The antenna/rangefinder (which is a separate piece that attaches to the side of the helmet) will also go all the way down. I’m not sure if very many people would want to display it down, but it’s nice to have the option — especially since the antenna makes the piece pretty tall. Some people might want to lower it just to get it to fit on a shelf. Here’s the rear. Many people complained that he didn’t have part of his jetpack and rocket visible on the bust, but I’m not overly bothered by it. By the way, I should probably mention that this bust is surprisingly light. It’s clearly hollow, but that’s probably a good thing. Here it is in my current setup. As you can see, he’s quite a bit taller than the Gamorrean Guard bust. It’s really a big bust in person, which makes it very impressive, but also a little tricky to display. On my shelf, the antenna only just barely clears the bottom of the shelf above it. 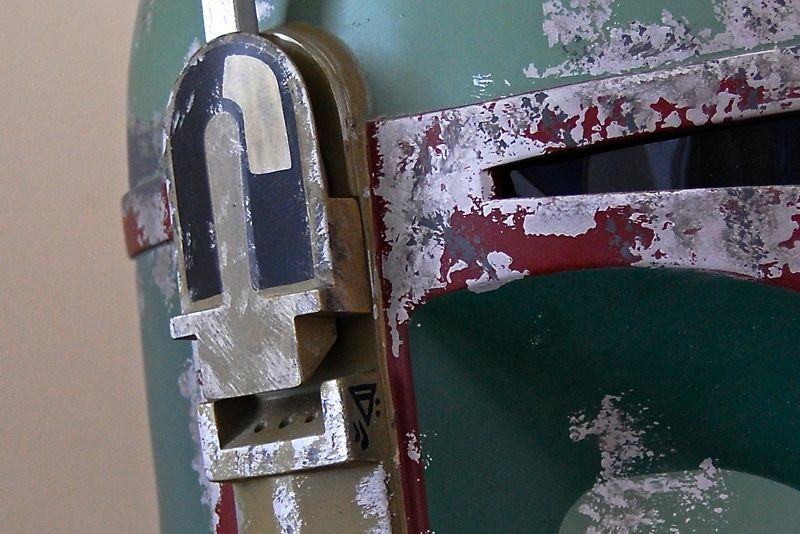 Next up, the Bronze Boba Fett statue, right?